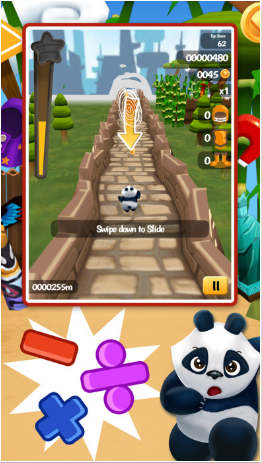 Math Run: Panda Chase is a super fun iOS app for grades K-5th learning basic Math skills (i.e. addition, subtraction, multiplication, etc.) This game follows the familiar "running" game-style and has students avoiding obstacles while solving Math problems. Also, there are lots of characters and levels to unlock to enhance replay value. Best of all, Math Run is tracks students progress, generates detailed reports, and is aligned to Common Core Standards. I highly recommend checking out Math Run: Panda Chase by clicking here!! !